There are a number of bench spaces (half a bench plus a vise) available to rent on a session by session basis. These are untutored sessions for independent working. 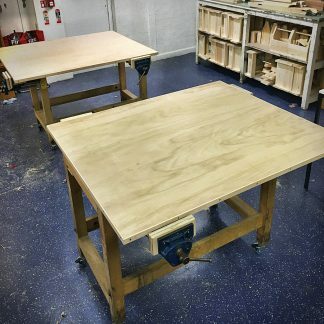 These sessions are for small woodwork or other craft projects to be made using strictly hand tools only and will be alongside a class taking place in the workshop. In order to avoid problems with noise, no power tools are permitted and, as we are a hand tools workshop without dust extraction, only very minimal sanding by hand. Planes and scrapers are recommended for the majority of finishing. The session fee includes use of the Makershed hand tools – please enquire to make sure we can provide the tools you need for your project.